The 24th of March marks the birthday of iconic British Designer William Morris, whose stunning patterns have inspired and influenced many designers across the globe. To celebrate this wonderful design icon why not explore Royal Crown Derby’s beautiful collection of fine bone china giftware pieces inspired by William Morris. 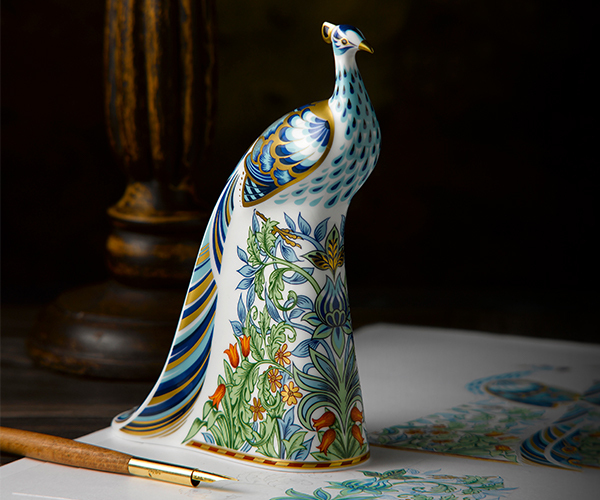 The collection features four beautiful pieces the Manor Peacock, Strawberry Thief Thrush, Parchment Owl and Periwinkle Owl, each adorned in a stunning design inspired by William Morris’s patterns. Take a look below to explore these luxury giftware pieces below. Standing proud, at a height of 19cm, with colourful detail of symmetrical blooms of wild forest flower, tulip and acanthus adorn the base of the Manor Peacock. Featuring beautiful shades of tonal blues with touches of orange sweeping along the body and tail feathers of this fine bone china piece. Geometric shapes depict the peacock’s plumage and tail feathers with outstanding colour, contrasting perfectly with the nature-inspired design in soft hues of pale green, powdery blue and subtle orange tainted with flecks and embellishment of 22 carat gold making this a stunning piece to adorn any home. Purchase the Manor Peacock here. 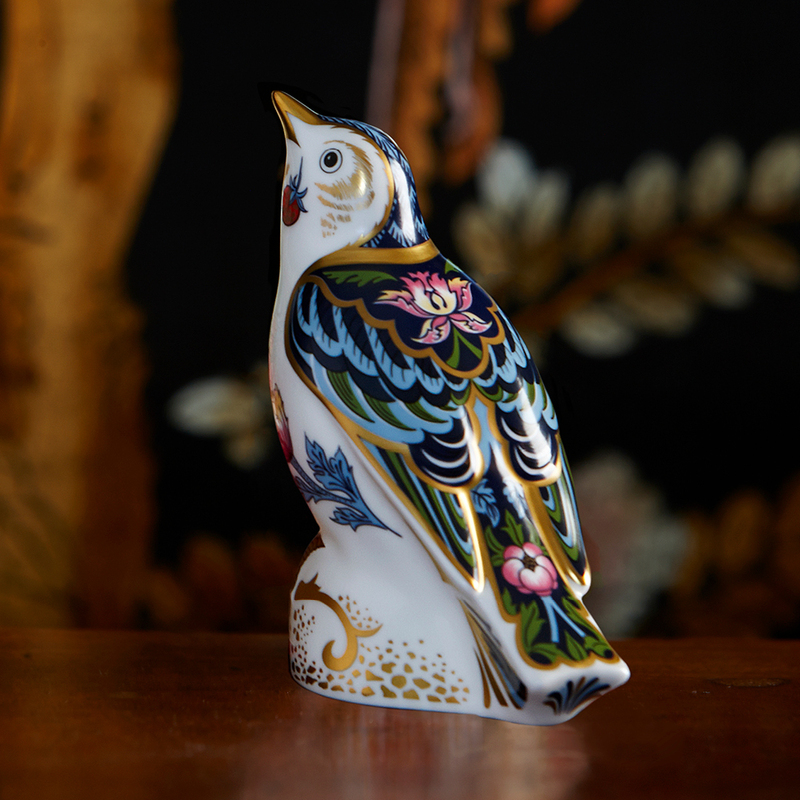 The Strawberry Thief Thrush is adorned in a beautiful pattern inspired by the Strawberry Thief, one of William Morris’s many iconic and popular designs. With significant origins in the heritage of the historical period, the thrush is decorated in a combination of muted blue tones with a flurry of green and damson florals edged in 22 carat gold. Purchase the Strawberry Thief Thrush here. Parchment Owl and Periwinkle Owl. Inspired by the pattern work of William Morris, the Parchment Owl and Periwinkle Owl proudly display an interpretation of the artists' archetypal stylised flora and fauna textile patterns. Featuring delicate swirl patterns overlaid with a mix of leaves such as the Acanthus and Tulip flowers, in symmetrical repeats. 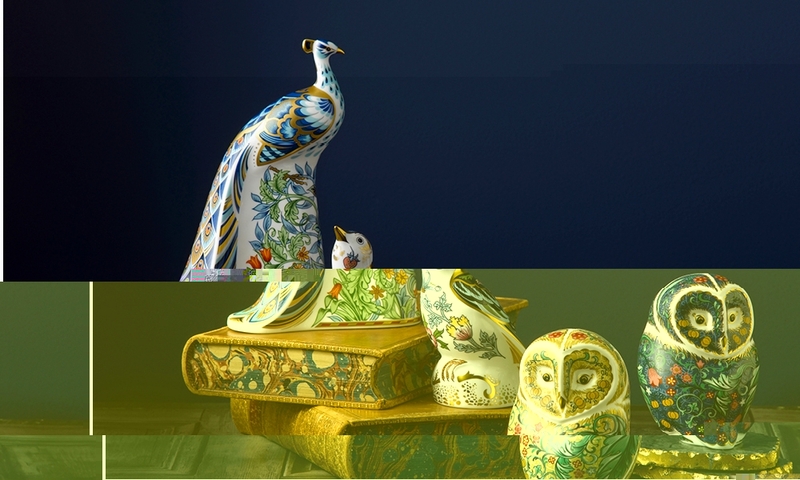 The Parchment Owl has a neutral base colour and with muted colours that feature in William Morris' original patterns, whilst the Periwinkle Owl uses a beautiful mixture of colours blue and green on a striking deep iris blue background each contrasting perfectly as a pair. Finished with accents of 22 carat gold highlighting the beak, eyes and feathering detail on each of the owls making either a perfect addition to the home. 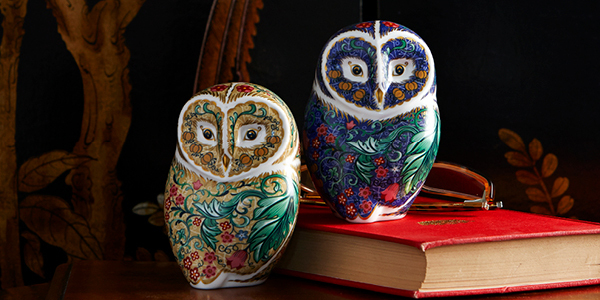 Purchase the Parchment Owl here and the Periwinkle Owl here.